Gary Lineker has again encouraged Uefa to consider a one-season experiment which would see the away goals rule abolished. 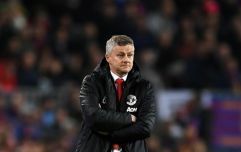 Following Manchester United's Champions League quarter-final first leg defeat to Barcelona on Wednesday night, Lineker suggested that the importance of away goals forces home sides to be overly cautious in the first leg. A Luke Shaw own goal separated the sides at Old Trafford, leaving United with plenty to do in the return leg in Barcelona next week. But Lineker believes that a change to the current rule will encourage both sides to be equally aggressive in both legs, rather than one team playing with more fear of an away goal being scored. "I don't know about you but I'd love to see an experiment for one season where they get rid of the away goal rule," Lineker said on BT Sport. Luis Suárez back breaks the deadlock at Old Trafford! Offside was called, but VAR overruled it! "They've got a fear of giving away an away goal or two and, if you get an away goal it's like, 'woah, that's it'." It's not the first time that a change to the away goals rule has been suggested although not everybody is a fan of the idea. Former United midfielder Owen Hargreaves, however, understood Lineker's point. Hargreaves responded: "You're right. Barcelona scored an away goal and then sat off. "The good thing for United is they lost the first game against Paris-Saint Germain 2-0 so they've been there and done it.